For those of you who haven’t yet heard of SBC I am going to gently introduce you to us. 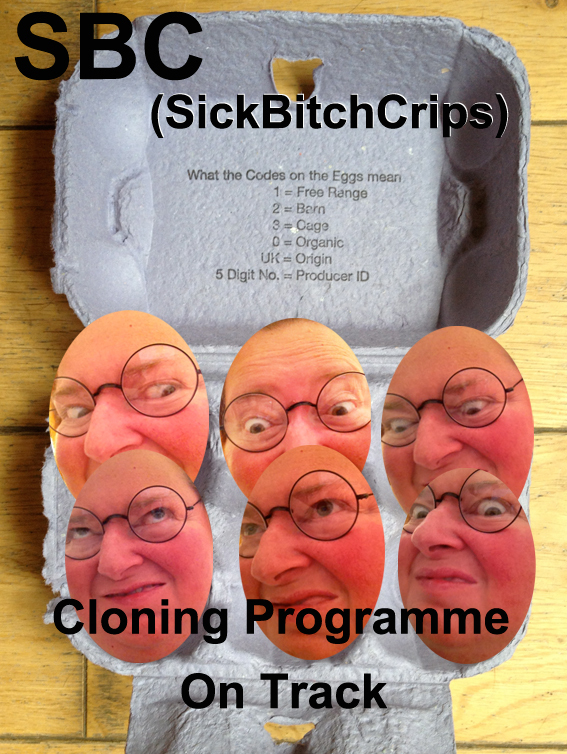 SickBitchCrips is an arts organisation made up of the most severely afflicted, contagious and diseased artists who have multiple disorders i.e. myself and any other specimens who feel they meet this hierarchal criteria. Extreme physical movement is forbidden and SickBitchCrips has no time for anatomically perfect people. We have been heavily involved in producing posters of late that are in par with those beautifully crafted images of the foot and mouth painters association. We intend to bring out a Christmas special something sometime soon and to get a taste of the wonderfully courageous work we do I have included an image with this blog. Due to our severe limitations we can take rather a long time to produce work, some may refer to our work as 'durational' but we see it as 'inspirational'. We believe the end result is worth it and we have some very important messages to put out there for anyone brave enough to engage. Similar to Damien Hirst and others we think about our work and what our next piece will be about, we have an affinity towards Damien because his work is about life and death and we believe our work is comparable to his but we tend to lean more towards imminent death. I am dying to tell you about the Christmas special something we intend to do but I have to hold back and try not to get overly excited because like many other artists we struggle, I mean seriously struggle to stay alive and continue to make work. It's not easy facing our daily tragic circumstances and SickBitchCrips embraces your pity and welcomes language that sees us as special, brave and amazing. Our mission is to be ghettoised and denied access to pretty much everything. SickBitchCrips is deserving, needy and our special needs will not hold us back from making mediocre art.